A place to share ideas of small steps of kindness that we can offer others, and a place to talk about our experiences. I'm rallying friends, writers, readers, and bloggers to make a commitment. 30 days of small kind acts. You can set a goal for one per day (like Penny Sullivan in the novel Stepping Into Sunlight) or one per week, or just one per month. Sound fun? Sound scary? Sound impossible? This site will provide community support, loads of ideas, and a place to share your cool experiences. Leave a comment at this post to show your interest. Then use the posts here to help you think of creative ways to bless others through small acts of kindness, and please feel free to leave comments with your own ideas! 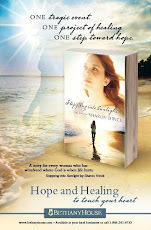 To KRISTY who won the January drawing for a free copy of Stepping Into Sunlight to share with a friend. Kristy, email me through my website with your snail mail address and I'll get that out to you! And congratulations to everyone else who continues to share wonderful ideas for reaching out to others. Small steps of kindness are one humble way we can reflect God's love to the people we meet. Please keep posting comments with your ideas and experiences...and scroll down to read what various people have shared. I've had such fun in the past few months hearing from readers of Stepping Into Sunlight. Folks with some painful challenges are reaching out to show love to others. Serving others from their place of brokenness. Moving toward hope and healing. The character of Penny Sullivan is being joined by many other "Pennys." Please feel free to keep sharing your ideas for small acts of love here at this blog: little steps of kindness, creative ways to reach out, experiences you've had with Penny's Project. Leave a comment during January at THIS POST about your experiences, and you'll be entered to win a free copy of Stepping Into Sunlight to give to a friend! During the time the Penny's Project blog posts began posting, and my new novel, Stepping Into Sunlight was heading out to meet the world, I was blessed by many kind acts specifically thought up by friends as a way to support the new book. I just had to share a few of them here. In part, I share these to say a huge THANK YOU to all the people who have brought me to tears with their kindness, but also because some of these are ideas you may want to use in supporting a favorite author one day. Janelle spent a day with me (and more time later) creating beautiful hand-crafted "Penny's Project" notebooks that I could give as doorprizes, to store managers, and to people who came to my book launch event. Laura and Ginny both wrote and offered to mail out postcards to her friends to tell them about Stepping Into Sunlight. Deena wrote and said she was declaring October to be "Sharon Hinck Month" on her blog, and was personally purchasing my books to give out as prizes. Cynthia included a full-page ad in her fall magazine - as a gift! Judy wrote to tell me how much the book meant to her and that she planned to get it ordered by her library system. Jeanette composed an email about the book to send to everyone she knew. Joyce emailed and reminded me she was praying for me throughout what was a very busy month for her. Sue stopped me in the church lobby to tell me about certain scenes she really liked in Stepping Into Sunlight - which totally encouraged me. Those are just a few examples of the kindnesses that were shared with me recently. And of course many of you talked about this blog project on your own blogs and directed people here. So thank you to everyone who participated in sharing their terrific ideas, who posted comments, who sent me emails encouraging me in this project, and who also wrote to tell me how much the book spoke to you or encouraged you. I want to take a moment to thank all the brave and kind souls who joined Penny's Project this month and set about doing some small steps of kindness. Some participated once a week, others set a goal to do something new each day. I've discovered that in the process of looking for ways to share a kindness, I've been noticing people more--watching for possible needs, paying attention to the kindnesses given to me. I'll be hitting the road soon for a lengthy booktour, but if you drop by while I'm gone, feel free to read the past posts and the comments from other creative folks who've contributed great ideas to Penny's Project. 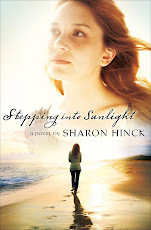 And if you still need more ideas, grab a copy of Stepping Into Sunlight (the novel that inspired Penny's Project). Let's all keep noticing others and offering them the "widow's mite" - the penny's worth of love that seems so tiny, but can be so profound when God multiplies it. Years ago, two friends and I dressed in peasant garb and sang Fiddler on the Roof songs for a show. I still love the song, "Matchmaker." And I love to make matches. At a recent conference I met many new people, and if I learned something about the new friend that fit with someone else I already knew, I tried to help them find each other. There's a wonderful joy in creating webs of relationships. In "Stepping Into Sunlight," Penny helps weave some interconnections between her child's school, the store-front mission in the neighborhood, and the members of her support group. Think about the people you know. Is there a single mom who would love to be introduced to a great car mechanic who will give her a fair price for an oil change? Is there a harried mom needing that reliable teen that you know who could babysit? Is there a friend who loves to quilt who would love to connect with the sewing circle at your church? See if you can find a match to make for your step of kindness today! I recently attended a major writer's conference. I had a full schedule of teaching and meetings, and was getting over some health issues and was battling exhaustion. One morning, a friend found me and gave me a little tin of mints - personalized with my name on it. It was such a special pick-me-up - especially because when she was in the store that carried these, she had to twirl that rack of mints and look for my name to find this. I felt so REMEMBERED and thought of and loved. Later, a friend gave me her hotel room key (I was staying off-site) and said, "Go up and take a nap if you need a break. Use my room." I can't express what a treasure that was to me. Then at a banquet, another friend gave me a card and a box of luxurious mints. Her words sang to me, and of course chocolate is ALWAYS a brilliant way to make someone feel loved. 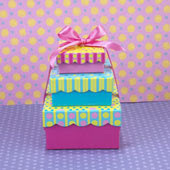 I'm planning to look for a way to give a thoughtful small gift today. Will you try that with me? I don't think my friends had any idea what their gifts meant to me and how they kept me going when I was weary. We may never know how our gifts lift the heart of a friend. But let's do it and trust it might just be the blessing they need. Each fall, my church small group shows up at our pastor's house one afternoon to "rake and run." We scour that yard and cart off the bags of leaves. One winter, while I was battling bronchitis, chasing young children, and my hubby was out of town, we were hit with a bad snow storm. A neighbor saw me outside struggling with my shovel and the heavy wet FEET of snow, and shooed me aside to snow-plow my sidewalks as well as his. If you live in an urban high-rise, perhaps you could sweep someone's parking space instead. I know you'll come up with something creative! Be sure to keep posting your experiences and ideas! My tomato plants did well this year, but harvest time has arrived and I don't have time to can or process all of them. We've been eating BLTs morning, noon, and night. How fun to discover that I can share the produce from my garden with a neighbor or friend - or even a local food shelf. Perhaps you don't have a vegetable garden, but you have some flowers. Could you cut a few and give them to someone? Or if you don't have a yard at all, do you have a little potted plant you could divide and share? Or if you have perennials that can be divided in the fall - consider asking a few friends if they'd like some for starting in their own garden. If none of those options are possible for you, you can still buy a bunch of daisies to give someone. Growing things make wonderful gestures of kindness! Okay, for some folks, this one is tough. It takes a little thought, and a little time. But it can be a huge gift. Better yet, the friend or relative who receives will have a tangible reminder of your love to revisit again and again. Notebook paper, or scented stationery. A beautiful hand-made card, or a simple piece of typing paper. But take the time to hand-write some words of encouragement and love. Skip the computer/word-processor/or even typewriter. Leave your fingerprints all over the page. Then slip it into an envelope, address it, and mail it. As a bonus, consider decorating the envelope with stickers or artwork. Imagine how they'll grin when they open the mailbox and find it a few days from now. Sure, we live in an age of cell-phones, emails, and instant messages. But that will add extra sheen to the glow of this kindness. Take the time to send an old-fashioned letter. Friends of mine were once missionaries with an organization based out of Holland. I remember them telling me how when the community gathered around the supper table, all the members stayed alert to those around them, so offer them the pitcher of water or a second helping of food, or to pass the salt or butter. It was considered bad form to NOT be alert, so that someone had to ask, "please pass the water." Far better to notice their glass was getting low and anticipate their need - offering before they even had to ask. I've always remembered that story and wondered how I could learn to be more attuned to the needs of those around me - so they don't even need to ask. Today, let's try to anticipate some needs. Do you know your child needs some quiet nurturing when they get home from school? Can you prepare a favorite book and her dearest stuffed animal and offer her a storytime when she gets home? Does your husband love iced tea? Can you pour a glass for him and have it ready when he comes in the door? Do you know a coworker gets hungry at 3:00 pm each day? Could you bring a snack to share? See if you can anticipate a need today - and offer a kindness before the person you are offering it to even realizes they would like it. One of my favorite scenes in Stepping Into Sunlight, is when Penny gives a Fare Card for the city bus to a stranger. You may not live in an urban area with fare cards, but a grocery store card, or a gift card for a general sort of store like Target would be another good idea. Years ago we had friends going through job loss and financial struggle. We delighted in leaving an anonymous gift card tucked in their front door with a note saying it was just to let them know they were loved. Anonymous gifts are so fun, because we KNOW we won't get "credit" from the recipient. We just get the pure joy of giving. Do you know someone who could use a gift card today? Can you find way to get it to them without them guessing it came from you? When the phone rings, I rarely race to grab it. Usually it's someone needing something. But occasionally the phone rings and it's a friend calling for no other reason than to chat. They just want to spend time with me. Pick up the phone today and call someone. Make it clear you are calling JUST BECAUSE you enjoy them so much and wanted to hear their voice. Ask about their life and LISTEN. Sometimes we use the words as a fall-back when we feel helpless . . . as a last resort way to offer comfort. But it can be a powerful act of kindness, especially if we follow through. Recently, I blogged about a woman who emailed out of the blue to tell me that God has suddenly placed me on her heart and she was praying for me, although she didn't know why. I suspect she worried she would sound a bit silly - especially if there were no special needs in my life. But what she didn't realize at the time was that she emailed me on a very crucial morning. You can read the whole story here. Have you ever been praying and felt the Holy Spirit bring a specific person to mind with special emphasis? Have you called or emailed to tell that friend, "I'm praying for you."? Let's add that idea to our arsenal of kind acts. We can wait for someone to share a problem and then offer to pray. But we can ALSO actively ask God to bring to mind someone He wants us to support through our prayers. With or without their knowing, we can do kingdom work through that kind act. Please share your comments about times when the prayers of others supported you, or ways that you've prayed for friends! Since childhood, I've enjoyed designing special projects like the character of Penny Sullivan did in Stepping Into Sunlight. As a wife and mom of four, I'm blessed with folks to whom it's easy to show love. But I still like the idea of challenging myself to reach out to new people -- even total strangers --- in creative ways. My local Christian radio station, KTIS, has been promoting something called "Drive Thru Difference" - where listeners are encouraged to pay for the person behind them at the drive-through as a surprise gift. Have you ever participated in a special project like one of these in the past? What did you do? How was it received? Feel free to share ideas in the comments. We all know the horrible feeling of finding out someone has said something mean about us behind our back. But there is an equally powerful joy in learning someone shared a kind report about us to others. I recently attended the International Christian Retail Show - an exhausting experience. One day, I got a call. A store manager had stopped by my publisher's booth and raved about my books. They told him I was at the conference, and called me to arrange for me to meet him. I was so encouraged by his enthusiasm. But it also felt amazing to think of someone "talking behind my back" in such a terrific way. He made me look good to my publishers. In Stepping Into Sunlight, Penny tells a store manager about a clerk that has done a terrific job. The manager and clerk are both startled, but it makes the clerk's day, and raises her in the eyes of her rather cranky manager. It's so much easier to whine and complain about people. I confess I slip into it far too often. But I've been concentrating on finding opportunities to genuinely talk up someone I like or admire behind his or her back. They may never find out, but it does raise their esteem. And if they do hear about it, it just might make their day. Can you think of someone you could speak well of behind their back? When I first shared this topic while we were just getting this blog started, several people shared how they make a point to tell a manager when a waiter or waitress has done a great job. That's another great way to bless someone with words of kindness. Feel free to share your stories here. Courtesy isn't so "common" these days - but, wow, can it make a difference. Yesterday a visitor to the blog shared a beautiful story in her comment about how strangers reached out in little ways and made a difference during a challenging day. Today, let's all look for an opportunity to hold a door for someone, let someone else get in the elevator first, or offer to hold a crying baby so the mom can dig through her bag for a binky. Let's step back and gesture to someone that they can go ahead of us in line at the bank or grocery store. Even if you spend most of the day at home, see if you can find a way to offer extra courtesy to others in your family. Then please share your ideas! September 11th seems like a good day to look at the other directive in Romans 12. We already looked at the call to "Rejoice with those who rejoice." Today let's think about "Weep with those who weep." Often we're fearful of drawing close to someone in pain or grief. We're afraid of saying the wrong thing, making things worse. But simply letting our eyes fill with compassion as a friend shares their pain, can be a tremendous gift. On a side note, the effort to think of small kind acts for each day has helped me notice more of the kind acts that others have done for me. I have my radar up because I'm looking for good ideas to share on this blog--and it's stirred a deep gratefulness in me. People are kind to me so often! In all of the ways I've listed here. Have you found the same thing? Have you been noticing more of the kindnesses that others offer to you? Now, I'm going to think of my friends who are grieving the recent loss of a loved one, or suffering a health setback, or struggling with unemployment, and think of a way to quietly come alongside and just be there for them. In my pre-September warm-up posts, I shared about my daughter picking up litter in a movie theatre parking lot, and the story of the nun at a retreat who wiped up the bathroom to leave it nicer than the way she found it. I think that perhaps because of being a homemaker for so many years, and the inevitable extra "clean up after others" work that goes along with that, it's easy for me to tune out when I hear that gentle nudge. After all, I have spent years picking up for others. But no matter how many of our daily chores revolve around leaving a space better than how we found it, we can still reach out and do a little something extra. Will it be noticed? Perhaps not! But that's part of the fun. Go for a walk today and pick up some litter. Or tidy the breakroom at work (when no one is around to notice who did it). Or vacuum your spouses car and shake out the floor mats. Or share some other ideas you have! When my children were young, I'd stand in the doorway and rest my hand on their head before they left for the school bus and pronounce a blessing. Not quite the same as a prayer - a blessing if a bit more of declaration. "May your day be filled with reminders of how much God loves you." "May you find ways to bring light to your friends today." "May He send His angels to protect you and guard your steps." Often, I based those blessings on whatever scripture I'd read in my morning quiet time. Recently, several friends spoke blessings over me. One said in an email, "I just know that God isn't done with the issue that is on your heart. Don't give up. His answer is on the way." Part prayer for the situation, part declaration of hope, her words helped me. Another said in a phone conversation, "It's been a season of loss and difficulty, but I believe a season of God's abundance is coming for you. Be strong and tenaciously cling to the truth that He will fulfill His purposes." While this is a kindness that might be more appropriate for family and friends, I've also looked for ways to speak a blessing to others I encounter. To a lab technician at the medical clinic, I've said, "You are so good at making people feel at ease. I know you're going to be a comfort to many people in your work and make a lot of difference to others." How about you? Anyone you could speak a blessing over today? May the Lord bless you and keep you, and make His face shine on you today! A few days ago, I was making bookstore visits, stopping in to let the store staff know about my upcoming release, Stepping Into Sunlight. Store visits can feel a little like sales cold-calls. Not exactly the favorite activity for my an author with my personality type. Thankfully, I was treated warmly each place I stopped. But a few of the staff that I met really listened when I told them about the book. Their eyes didn't follow each person strolling by. They didn't glance at their watch after ten seconds. They smiled, they nodded . . . they took a moment to slow down and give the gift of attention. It meant the world to me. I've always been bad at giving that gift. When my kids were young, I had to clamp my mouth shut as they told long, out-of-breath, rambling stories. I was SO tempted to hurry them along, get them to the point. But the POINT was that they needed to be heard. They needed me to slow down, hit the pause button of my busy life, and listen. Today when you feel like rushing past someone, stop instead. When you find yourself "uh-huhing" faster and faster, hoping to get them to wrap up their thoughts, try slowing down and really listening. When someone in your family interrupts you in the middle of something, offer them your full attention - generously. Let's give someone the kindness of slowing down. Of hearing. 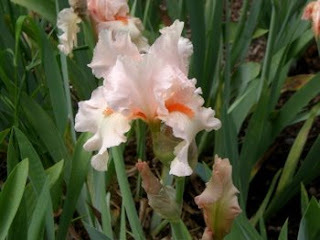 Of acknowledging that they are delightful and we want to spend a little time with them. Romans 12 calls us to rejoice with those who rejoice, and weep with those who weep. I'm a writer, and I struggled during the years before I was published as I would hear the joyous declaration of other writers announcing they had been offered a contract. Can you find someone in your acquaintances (or even a stranger who is being celebrated in some way) and add your voice of sincere congratulations? Recently, I had something really nice happen to me. Then a friend told other people about the nice thing and spread the good news. I felt warm and tingly and so appreciated and cared about. She could have said, "Good for you, but did I mention that everything is going wrong in my life today?" Instead, she said, "I'm really happy for you." And she set about multiplying my joy instead of chipping away at it. Remarkable. And a great example for me. I'm going on a hunt for people who could have their celebration multiplied a bit by my sincere congratulations. Throughout Scripture, kindness and hospitality are often represented by a shared meal. Even when a widow in Zarapheth (I Kings 17) had only a tiny bit of oil and flour, she shared it with Elijah--and the oil and flour never ran out. Can you share some food with some one today? Once when I was experiencing deep discouragement about my ministry with a Christian arts group, a friend declared, "When the going gets tough, the tough get pie." And she took me out for a slice of comfort--her treat. I've never forgotten how loved and nurtured I felt by that act. Bake a batch of cookies and bring some to a neighbor, a shut-in, a coworker, or a friend. Better yet, invite someone to supper. Keep it simple. A crockpot of simmering soup and a loaf of fresh-baked bread. In this era of convenience foods, anyone can obtain an easy, quick meal. But a dish prepared by you and given in love is far more than just calories for the body. It's encouragement for the soul. We clambered over boulders and pulled ourselves up the last part of the trail. My legs quivered from exhaustion. Sweat poured down the hot skin of my face as the sun seemed determined to press me back down the mountain. "Want a drink?" My husband handed me his water bottle. I had a bottle of my own in my backpack. I could have eventually dug it out. But the OFFER of a drink of water placed in my shaking hand was a gift that made that water feel even better than if I'd just provided it for myself. Let's be literal today. Be alert to the people around you. If you have young children in your home, tearing around the back yard, hand them a tumbler of cool water as they come in the door. Make iced tea for your husband, or pour a favorite soda for your teen as he comes in the door from school, and hand it to him. Anticipate a need and offer a simple refreshment. Then let us know how it went! Jesus said, "Love your enemy, pray for those who persecute you." A tall order when I get cranky even with those who are kind and delightful to me--like my family members and dear friends. "Enemy" is a strange concept, too, because in my daily life of housework, family life, and writing, I don't run into a lot of people who directly oppose, attack, or persecute me. But if we broaden our understanding of "enemy" to those who seem to hinder things from going our way, then some one may come to mind. Someone who nabs the good parking space, someone who jams up the customer service line with persistent arguments, the family member who makes us feel small with a barbed comment, the friend who blithely chats about a luxury vacation when we long for even a weekend getaway, a coworker who finagles their work onto our pile somehow. Has someone come to mind? Now - let's pray for that "enemy".... NO! Not the "teach them how wrong they are being" sort of prayer. Let's really dig deep and start thinking of the blessings we long for - love, fellowship, closeness to God, meaning and purpose . . . and let's ask for those on behalf of the "enemy." And while we're at it, a little confessing of our own selfish or harsh attitudes would be a good idea, too. Okay, now let's ask God to inspire a small kind act we can do for the person that came to mind. A genuine compliment (not to improve the relationship so WE feel better, but simply to bless them) or a word of praise to someone else about them. Or offering them our dessert. Or a handwritten note. OR, if there is an ongoing conflict about a parking spot, the way to roll up toothpaste, or the pile of work on the desk--how about giving ground--on purpose--as a gift of love? Today, let's prayerfully think back over someone we are grateful to that we haven't seen in a long time. An aunt or uncle you once spent the summer with? A high school band director? A pastor from a church you haven't attended in years? Once you've thought of a few people who were blessings to you once upon a time, see if you can find an email or snail mail address or phone number for that person - and surprise them with a "thank you." Even a postcard saying, "Thinking of you today, and the way your encouragement when I was young helped shape my work today" will be a delightful "out of the blue" surprise! Let's be detectives and see if we can find some people from our past and thank them! Visit a friend's blog and leave an encouraging comment to one of his or her blog posts. Let them know you appreciate what was shared. Let them know someone has read what they are writing. Let them know they are being heard. Don't have any friends who blog? Visit a favorite blog or website by someone you DON'T know and post a complimentary comment. I'll try to post an idea each day in September - our Penny's Project month. If I don't keep up with a new one each day, I hope these will be supplemented by great ideas by all of you!!! Please comment about small acts of kindness that you have done, or plan to do, or that have been gifted to you. Day one, we're starting with something VERY easy. Not costly, not scary or difficult, no sacrifice required. Send an email to someone whom God brings to mind. Sounds like a tiny, not-highly-meaningful act. BUT there have been days that a loving, genuine, personal, encouraging note from a friend in my email box TOTALLY helped me through a dark day. I'm NOT referring to jokes and cartoons and group emails that are forwarded around and clutter our boxes. I'm also not counting a friendly affirmation included along with a request. I mean a pure, personal, encouraging and kind note for no other purpose than to let someone know you care about them. guide us to a name...then guide our words. and hit "send" with a prayer on our lips for you to bless the friend who will receive our message. Amen. And continue to invite your friends to visit this site and join us in Penny's Project - sharing a small step of kindness with a new person each day! My author copy of Stepping Into Sunlight arrived in the mail! It's shiny, smells of fresh ink, and is such a miracle. When I think of the two years of heart, soul, and labor that went into this - not just from myself, but from editors, test readers, designers, type-setters, artists, marketing folk, critique buddies - I'm overwhelmed with gratitude. Think of a friend who could use a reminder that they are not forgotten - that you care about them, and God does, too. Order a copy of Stepping Into Sunlight, and give it to them. It's not a "how to" book. It's not full of suggestions or advice. It's just a story. Sometimes a story is exactly what we need. For those of you who want a glimpse of the upcoming Stepping Into Sunlight novel (which inspired "Penny's Project"), you can view this brief book trailer. Enjoy! Lately I've had the gift of that question offered to me by several friends. I was talking about some discouragement . . . okay, I'll be honest, more of a feeling of hopelessness about some things that matter deeply to me. Several friends, via email, phone, or in person, listened, cared, and said those precious words. How can I help? Today, when someone across from us is angry, hurt, hopeless, or weary, let's offer a shoulder, a hand, a hug. And before giving suggestions, let's first meet their eyes and ask, "How can I help?" Sometimes a person is too lost in the dark valley to KNOW what to ask for, or what they need. They may not be able to answer that question. Then we can get creative and offer a few ideas. Sixteen years ago, I was seriously ill for several months. I was so sick that when people asked how they could help, I was too muddle-headed to think of an answer. So friends came up with their own ideas and shared love in a zillion ways. One of the most unique was a woman from church that I didn't know too well at the time. She called up and said, "Can I please come over and clean your bathroom for you? I'm good at cleaning, and I want to help, and that's something I could do for you." What a wonderful, specific, humble, beautiful offer! I still remember how great it felt, after so many weeks of not being able to keep up on housework, to have a sparkling clean bathroom. Has anyone asked you this wonderful question lately? And have you had an opportunity to ask it of anyone? Mimi is the first winner of a Penny's Project notebook (inspired by the one that Penny uses in the story Stepping Into Sunlight) where she can jot down her ideas for small steps of kindness. Coming out of a movie theater after a family outing, my youngest daughter picked up something from the ground. I looked over, thinking she'd dropped something. She shrugged. "Something for me to throw away later." Litter? She was picking up litter in a big old public parking lot? When we got home, I sidled close to her and said, "Hey, thanks for doing that. But what made you think of it?" She explained that on her recent mission trip, where she worked to clean and paint a community center, they discussed the issue of being a servant. It was easy during the parameters of the mission trip to think about giving their labor to others each day, but could be easy to forget about once they got home. My daughter didn't want to revert to the way most of us function - avoiding the dirty jobs. She wanted to bring the attitude of humble service into every day. And other than this time when I caught her at it, it's the sort of quiet service that no one will ever see or praise or reward. I once spent a week at a retreat center, and a nun who was also on the retreat wiped down the public restroom's sink and counter after getting ready in the morning. I never would have thought of doing that...leaving the space nicer than it was for the stranger who would use it next. Can you think of other "invisible" acts of servanthood? I just returned from the International Christian Retail Show - an exhausting experience. One day, I got a call. A store manager had stopped by my publisher's booth and raved about my books. They told him I was at the conference, and called me to arrange for me to meet him. I was so encouraged by his enthusiasm. But it also felt amazing to think of someone "talking behind my back" in such a terrific way. He made me look good to my publishers. Everyone who comments will be entered in a drawing for a free Penny's Project Notebook. Last week I read your Book Buddies update and your account of the "kindness" in the grocery store. I turn off the computer and head to the grocery store to do my weekly shopping. I was looking through a display stack of tortillas, checking the expiration dates on the packages. I pulled one off the stack, and the entire display fell and packages of tortillas splattered at my feet. Honest! This really happened! My first impulse was to run out of the store. Then I thought of you and the Buddy update. I bent down to pick up the packages of tortillas and restack the display. Before I could pick up even one package, a clerk was bending down next to me. "That's okay," he said. "This happens all the time. I'll pick them up. You go ahead and finish your shopping." Thanks for sharing, Judy! Isn't it fun to notice the small kindnesses given to us each day? It gets me excited to find ways to make someone else's day. Has someone blessed you with a gracious word, a kind gesture, a small gift? Post a comment about it between now and August 1st, and I'll draw a name to win a free Penny's Project notebook! I truly spend most of my life floundering around convinced I'm not of much use to God's kingdom and wishing I could do something more to lift the load of my friends who are hurting, or to honor His name, or to meet the needs I see in the world. Every now and again, God gives me a glimpse of a way He HAS used me when I wasn't looking. Months ago I hosted a small gathering at my home. One of the women had shared about some discouragement, and as she left that evening, I casually said, "If you ever want to talk, feel free to call." Simple words. Tossed out almost without thought. Certainly no great act of sacrifice or love. This was a sweet woman to whom it was easy to reach out. But she later wrote to me and shared that the simple invitation was an answer to a long battle she had fought with feeling insignificant. She had been praying that God would do something to reassure her that she was lovable, that she was important to Him. Standing on my front porch, she felt His answer. I've been on the receiving end of those sorts of timely, kind words, as well. Last winter, I was facing a scary heart catheterization procedure. The morning before heading to the hospital, I opened my emails and found one from a woman I'd met briefly several months earlier (who knew nothing about my health struggles). "I don't know why," she wrote. "and this might sound weird. But for some reason God has really impressed on me that I should pray for you. So I wanted to let you know I'm praying." I put my head on my desk and burst into tears. Joyful tears. Without me even asking, He was nudging people to support me in prayer. How about you? Have you ever received the gift of a kind word at a crucial time? Or have you said something and later learned it was exactly what the other person needed? Proverbs 25:11 says, "A word aptly spoken is like apples of gold in settings of silver." Let's find some ways to share golden apples today! You can visit the Random Acts of Kindness Foundation here. 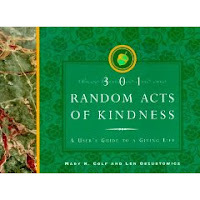 In 1994 Mary Colf wrote 301 Random Acts of Kindness. 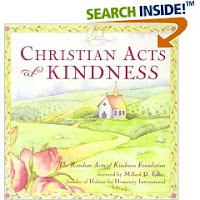 In 1999, Barbara Johnson wrote a children's book called Christian Acts of Kindness. But some of my favorite examples of the power of small acts of kindness are recorded in the New Testament Gospels. A little boy shares a few fish and loaves of bread, and Jesus multiplies it into enough to feed thousands. A widow gives two small coins, and Jesus says that while others coming to the temple gave large amounts, the woman's gift was precious because she gave all she had. Even further back, in the Old Testament, another widow makes a meal from her last bits of oil and flour for a weary prophet, Elijah. And as he stayed with her and her son, day after day, God miraculously kept the oil and flour from running out. What I love about the Biblical accounts, is that the human part of the equation is hopelessly inadequate for the need--yet God takes our small offerings and accomplishes His purposes. Kindness isn't about celebrating human goodness, but about being a vessel that share's God's greatness. Have you ever done a small simple act and been surprised by the way God did something much more profound through it? Tomorrow I'll share an example from my life. One year during Lent, I tried to do a secret good deed each day (it's harder than it sounds!). Another time, I set out to send a letter of gratitude to a different person each day during November (in honor of Thanksgiving). As a wife and mom of four, I'm blessed with folks to whom it's easy to show love. But I still like the idea of challenging myself to reach out to new people in creative ways. Have you ever participated in a special project like one of these in the past? What did you do? How was it received? Feel free to share ideas in the comments. And to join our Small Steps of Kindness Movement - leave a comment HERE, and I'll get you added to our list. During the month of September, we'll rock our world with small acts of love that God can multiply. In the novel Stepping Into Sunlight, the character Penny Sullivan creates a plan in a little yellow notebook. She calls it "Penny's Project" and uses it to brainstorm ideas and also record small successes along the way. As she struggles to heal from post-traumatic stress, she turns her gaze outward as much as she is able - and sets out to do a small act of kindness for a different person each day. Some of her steps of kindness are spontaneous. When she's in a pet store and the clerk reaches out to her son, she makes a point to tell the manager how terrific the clerk was. Others good deeds take planning - like collecting a small item for a member of her victim support group. Some are common and familiar acts. She sends a card and note to a friend, or phones a family member to connect with them. Others are new ventures - helping a neighbor put up a wallpaper border, or handing a Farecard to a stranger at a bus stop. Let's begin sharing! Post kind acts you've offered, or ideas you plan to try HERE! I'll compile comments from time to time and create a post of ideas on various themes. Years ago, I lived in the Tidewater area of Virginia (where Stepping Into Sunlight, the novel, is set). I was an exhausted grad student with a toddler and baby-on-the-way. One day at the local grocery store, I was hurrying to grab a few things and get home in time to trade off the car with my hubby who would head off to one of his jobs (he was also in grad school). I reached for an orange, and several fell from the display, bouncing around my feet. Embarrassed, I bent clumsily and tried to chase them down, fighting back tears because I was so exhausted, and the escaping oranges felt like the last straw. "Ma'am, don't worry about it." A young stock-boy offered me grace with his friendly smile. "Happens all the time." He waved me along and picked up after me. I never forgot that small act of kindness. He didn't know how tight my lungs had been feeling, how heavy my shoulders, how jangled my nerves. But he lifted my burden on a day I desperately needed it. I realized that day that I underestimate the value of a small kind word, a simple act, a warm smile. This site is all about celebrating ways to love others -- even strangers. We'll be taking little steps, sharing the adventure, laughing over the attempts that fall flat, and watching to see what surprises God may have in store. How about you? Has someone ever offered you a small act of kindness that touched your place of deep need? Post a comment here. Maybe some of us can duplicate the good deed! little acts of love, small steps of kindness, spontaneous deeds that bring joy to someone else. From time to time I'll organize and compile ideas around themes and use them in posts. In the novel, Stepping Into Sunlight, Penny Sullivan pulls out her little yellow notebook, and sets a goal to do a small kind act for a different person each day. This blog is a community notebook, where we can support each other as we participate in "Penny's Project." Please use the comments feature to tell about kind acts you've done. I know that many people feel shy about sharing good things they've done, but it can provide inspiration and ideas for others. So feel free to invent a screen name or post anonymously if you'd rather. For the fictional character, Penny, reaching out in small and simple ways - to friends, family, neighbors, and often to total strangers - helped her in her journey of healing. I pray that each person who joins Penny's Project will be deeply blessed as they explore new ways to bless others.